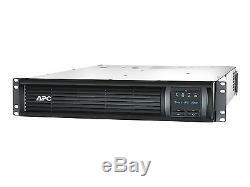 SMT3000RMI2U - APC Smart-UPS 3000 LCD - UPS - 2.7 kW - 3000 VA. APC Smart-UPS RM 3000VA 230V LCD 2U Rackmount. Wide input voltage range Designed for harsh electrical environments to save battery life. LED indicators Provide easy-to-read status of the unit and utility power conditions. Boost and trim Automatic Voltage Regulation (AVR) Eliminates voltage fluctuations as a source of AV signal degradation and component power-supply stress. Green mode Green mode bypasses unused electrical components in good power conditions to achieve very high operating efficiency without sacrificing any protection. Energy meter Provides actual kilowatt hours of usage for energy conscious users. Intuitive LCD interface Provides clear and accurate information with the ability to configure the UPS locally with easy to use navigation keys. Single switched outlet group Single outlet group that may be controlled separately from the UPS for discrete reboot of hung devices, sequenced on / off and non-critical load shedding. Pure sine wave output on battery Simulates utility power to provide a high degree of compatibility for active PFC (power factor corrected) servers and sensitive electronics. Disconnected battery notification Warns when a battery is not available to provide backup power. Sequenced network shutdown and reboot Customize network shutdown and reboot sequence of connected servers and UPSs. Adjustable voltage sensitivity Provides the ability to adapt the UPS for optimal performance in specific power environments or generator applications. Adjustable voltage-transfer points Maximize useful battery life by widening the input voltage window or tightening the output voltage regulation. Audible alarms Provide notification of changing utility power and UPS power conditions. Automatic restart of loads after UPS shutdown Automatically starts up the connected equipment upon the return of utility power. Cold-start capable Provides temporary battery power when the utility power is out. Hot-swappable batteries Ensure clean, uninterrupted power to protected equipment while batteries are being replaced. Network manageable Provides remote power management of the UPS over the network. Battery failure notification Provides early-warning fault analysis on batteries enabling timely preventive maintenance. Serial connectivity Provides management of the UPS via a serial port. Temperature-compensated battery charging Prolongs battery life by regulating the charge voltage according to battery temperature. Intelligent battery management Maximizes battery performance, life, and reliability through intelligent, precision charging. Frequency and voltage regulation Gives higher application availability by correcting poor frequency and voltage conditions without using the battery. Boost and trim Automatic Voltage Regulation (AVR). Pure sine wave output on battery. Sequenced network shutdown and reboot. Automatic restart of loads after UPS shutdown. AC 160 - 286 V. AC 151 - 299 V.
Power IEC 320 EN 60320 C20, power CEE 7/7 (SCHUKO), power BS 1363A. 8 x power IEC 320 EN 60320 C13 ï¿½ 1 x power IEC 320 EN 60320 C19. 2.7 kW / 3000 VA. 3.2 min at full load ï¿½ 11.5 min at half load. 1 x USB ï¿½ 1 x serial. 1 (total) / 1 (free) x SmartSlot. 1 x serial cable ï¿½ 1 x USB cable ï¿½ 1 x power cable - integrated - 2 m. Audible alarm, LCD display, Automatic Voltage Regulation (AVR), LED indicators. C-Tick, GOST, EN 60950, GS, VDE, IEC 62040-1-1, RoHS Exemption 7b, IEC 62040-2, IRAM, WEEE, REACH. All goods must be paid for in full before dispatch. This applies to all of our products. We will not accept cancellation by telephone. Please take care not to damage the packaging when opening/removing goods for inspection. Please note that you will be responsible for the costs of returning the goods to us and you must take reasonable care to ensure that we receive the goods back and that the goods are not damaged in transit. We will then ensure that we deal with the return as quickly as practical. We, us and our refer to Ballicom Limited Registered in England and Wales Company Registration 2799428 2. You and your refer to the purchaser of the goods from us 3. Consumer means any natural person who, when placing an order with us, is acting for purposes which are outside his or her trade, business or profession 4. Contract means the contract of sale between you and us for the sale of the goods Business Sales If you order goods other than as a consumer as defined above, the following Terms and Conditions do NOT apply to you By placing an order as a Consumer on our website, you confirm acceptance of our Terms & Conditions set out below. When you place an Order on our website, you will receive an automated Order Acknowledgment advice which is Not our acceptance of your order. No contract exists between you and us until we accept your order by despatching the goods. Description and Price of the Goods We make every effort to ensure that the goods described (together with the Images) are accurate at the time you place an order on our website. Please note that pictures are for illustrative purposes only. Actual product may differ from image supplied. We also make every effort to ensure that the price is correct at the time of order. However, if the price is incorrect and we discover the error before we accept your order, we will cancel your order or contact you to give you the correct price and then if you do not want the item at the correct price we will cancel your order completely. Force majeure We shall not be liable for any failure to perform, or delay in performing, any of our obligations under the contract if and to the extent that the failure or delay is caused by circumstances beyond our control Limitation of liability We shall not be liable to you for any loss or damage: where there is no breach of a legal duty owed to you by us or by our employees or agents or where such loss or damage is not reasonably foreseeable to us when we accept your order and to the extent that any increase in loss or damage results from breach by you of any term of the contract. Our maximum liability to you under the contract shall be the value of the goods that you ordered Nothing in these terms and conditions excludes or limits our liability for death or personal injury caused by our negligence or fraudulent misrepresentation or for any other liability that we are not permitted by law to exclude or (as the case may be) limit These terms and conditions do not affect your statutory rights. The item "Schneider APC Smart-UPS 3000 LCD UPS 2.7 kW 3000 VA New" is in sale since Monday, June 06, 2016. This item is in the category "Computers/Tablets & Networking\Power Protection, Distribution\Uninterruptible Power Supplies". The seller is "ballicom" and is located in UK. This item can be shipped to United Kingdom.